Years before Or Hadash was even a glimmer in anyone’s eye, a group called the Friends of the Reconstructionist Rabbinical College (RRC), which was located in two brownstone houses on North Broad Street, sponsored free High Holiday services for the community. They were conducted by rabbinical students and held at the Chapel of the Four Chaplains on the Temple University campus. After a few years, they were moved to the JCC on City Line Avenue in Wynnefield. Eventually, Dr. Sid Altman (z”l), who’d attended the High Holiday services with wife Barbara, decided that he’d like to establish a Reconstructionist congregation. He met with Rabbi Ira Eisenstein, son-in-law and heir of Rabbi Mordecai Kaplan, founder of Reconstructionism, who asked him, “Why a congregation and not a havurah?” Sid said, “What’s a havurah?” To which Eisenstein replied,” A congregation without headaches!” Sid thought that sounded perfect. A group that soon numbered twelve families, many of whom had attended the High Holiday services, met with RRC Dean of Students Rabbi Rebecca Alpert and started a havurah that would meet monthly in members’ homes on Friday nights and be loosely affiliated with the RRC. Members led services, which included much singing, many creative readings, and a discussion. Occasionally, students or faculty from the RRC would preside. One memorable evening, Dr. Ira Eisenstein himself led the service. The Havurah also assisted the Friends of the College in conducting the High Holiday services, which were free and open to the public. However, after complaints that these free services were hurting other synagogues’ ticket sales, they were stopped in 1980. That year, the Havurah conducted its own services in the Altmans' living room. After over three years of meetings, some Havurah members began to feel the need for a more organized approach and the guidance of a rabbi. Some even realized that they might soon need a religious school. Altman, and Roz Handel (z”l) (one of the organizers of the Friends and a member with her husband George (z”l) of the Havurah) were on the Board of the RRC, which had recently moved to Wyncote. The Dean of the College, Ron Brauner, expressed the desire to have a congregation at the RRC as a “laboratory” for the student rabbis, and Sid and Roz jumped at the opportunity. 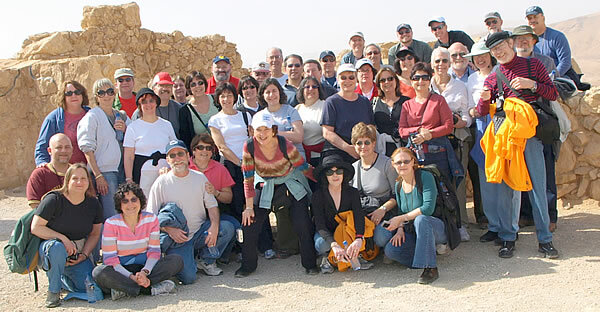 The Altmans, Handels, Shelley and Ken Rosenberg, and Fred and Eleanor Hofkin (z”l), all members of the Havurah, were joined by Burt and Barbara Siegel and Shelly and Paula Pavel. A fateful meeting was held around the Altmans' dining room table and the intrepid group took their amazing “leap of faith.” They agreed to become the Congregation of the Reconstructionist Rabbinical College (CRRC) and wrote a “Position Statement” setting forth their goals. They also agreed to hire four student rabbis, as the College desired, for a cost of $20,000! Meetings were held fast and furiously in the spring of 1983. By June, the group had elected officers, asking Sid Altman to serve as the CRRC’s first president. They hired four student rabbis: Mark Levine, Vivian Benor (Schirn), Barbara Penzner, and Judy Gary. Shelley Rosenberg wondered how the six families would pay the promised rabbinic salaries if no one else joined and asked husband Ken, an attorney, about the legal responsibility. He replied that, while there might not be a legal responsibility, there was certainly a moral one, since the students had foregone other student pulpits to accept jobs with the CRRC. The group threw themselves into planning an event that would make their new Congregation known to the world…. or at least, Jewish Philadelphia. An initial open house in June drew over 100 people, and 17 households joined immediately. Additional open houses and services were planned for the summer and 65 households joined by the High Holidays. Curtis Hall, in the Arboretum, was rented for Rosh Hashanah, and services for Yom Kippur were held in both the Bet Midrash and a large basement level classroom at the College. It was decided that the four rabbinical students would rotate primary responsibility for the congregational pulpit on a monthly basis – a kind of “if it’s October, it must be Rabbi Schirn.” This was only marginally successful, as it was difficult to form a relationship with any of the four. When Mark Levine graduated, in June of 1984, the Congregation received permission from the RRC to continue with three pulpit rabbis. The relationship with the College was a close one, a key to the initial success of the Congregation. Three members of the faculty sat on the Congregation’s Board as advisors, although the CRRC maintained its independence. The Congregation’s funds were banked with the College, which handled all payments and covered the Congregation’s expenses until it had sufficient income to manage alone. Membership in the Congregation was free to any RRC students, faculty, and staff who wanted to join. Although the Board had not anticipated starting a school immediately, it quickly became obvious that the need was there. Paula Pavel chaired the Education Committee, and the school, which was taught by the four rabbis, met every other Tuesday and one Saturday a month during Shabbat services. 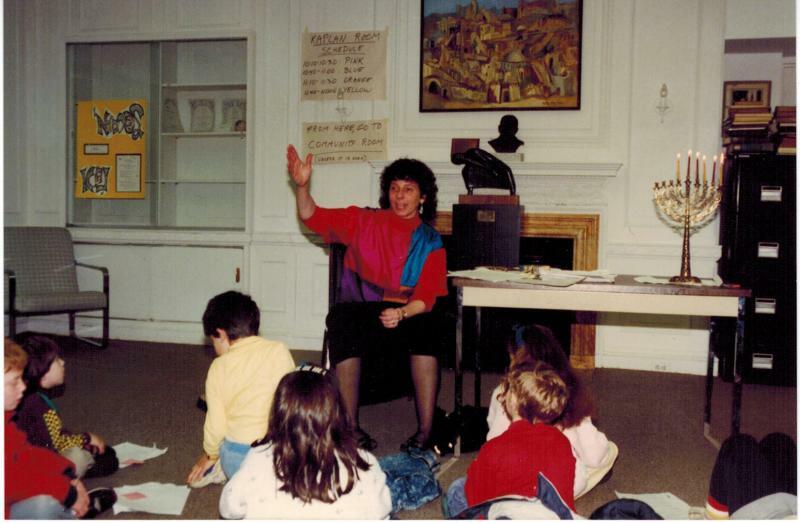 In 1984, student Rabbi Julie Greenberg was hired as Educational Director. The participatory, creative style forged from the beginning set the standards for the ongoing life of the Congregation’s school. One former student, Johanna Moss, credits her career in Jewish communal life to her years as a student at Or Hadash, while another, Jessica Rosenberg, is the first former Or Hadash student to study at the Reconstructionist Rabbinical College. From the beginning, the CRRC had a style all its own. Its founders determined that it should be informal and participatory, a contrast to the formality of the synagogues of their prior experience. The Reconstructionist model of a lay-rabbinic working partnership allowed the group to learn, innovate, and learn again. Many of the Congregation’s traditions have their seeds in those early days, as the Congregation’s pioneers experimented. After the first year, the Board implored Sid Altman to accept a full two-year term as president of the Congregation that would not have existed without his vision and persistence. Thus, Sid served from 1983 to 1986. Burt Siegel, who had served initially as Treasurer, followed as the CRRC’s second president (1986 – 1988) and oversaw exciting growth and the development of strong community spirit. The Congregation initiated a Caring Committee, Tikkun Olam Committee, newsletter (Ha Kesher – that initially was mimeographed and, in 1995, won an award from the Reconstructionist Movement), and Rabbi’s Discretionary Fund. It participated in the Israel Independence Day Parade, held its first fundraiser with music by Joe Aronson and Penny Aronson, and began a Yom Kippur appeal to congregants to contribute their time and talent to the community. The next few years saw steady growth in membership, and in 1987, the congregation requested permission from the RRC to hire a graduate, pulpit Rabbi. The CRRC would no longer be a laboratory for student rabbis, although the Education Director would still be a student. Rabbi Vivian (Benor) Schirn, one of the four original student rabbis, was eager to return to Philadelphia after spending two years at a synagogue in New Jersey, and was hired as the Congregation’s full-service, although part-time, Rabbi. The following year, the Congregation began holding discussions about renaming itself with a Hebrew name. It was now financially independent and wanted a name that would better describe and crystallize the community’s identity. The discussions took almost two years, and the name Reconstructionist Congregation Or Hadash was adopted in 1989. The name was chosen from the verse in the Psalms, "Or Hadash al Zion Ta-ir" ("Cause a New Light to Shine upon Zion"). In 1988, Shelley Kapnek Rosenberg, who had served as Vice President for both Sid and Burt, was elected President. Membership continued to increase, the Congregation having dropped the arbitrarily chosen one hundred household cap on membership that had been instituted when a hundred families seemed like a grand number, and the congregation was beginning to outgrow its home. Although emotionally tied to the RRC, the members of Or Hadash decided to initiate a capital fund raising campaign and seek a new facility. At the same time, additions and revisions to ritual policies were among the community’s most compelling interests. Through the Reconstructionist practice of study and discussion, the Congregation adopted policies for the participation in both ritual and governance aspects of the community of non-Jewish members. It created a High Holiday prayer book, a guide for helping members during the Shiva period of mourning, and hosted one congregant-led Shabbat service a month. In addition, a fund-raising committee initiated both the first Hanukkah Bazaar and a Goods & Services Auction, and Rabbi Vivian organized a support group for inter-married couples. And, for the enduring good of the community, Ben and Joan Dickstein endowed the Scholar-in-Residence Weekend. The Scholar-in-Residence weekend led to a special relationship that Or Hadash would enjoy for many years. Rabbi Nancy Fuchs-Kreimer spoke on the origins of Christianity and, having seen it advertised, Reverend Tom Martin of All Hallows Episcopal Church attended Friday evening services sans clerical collar. Shelley and Ken Rosenberg, spotting a newcomer –and, they thought, potential congregant – sat with him at services and welcomed him in typical Or Hadash fashion. Although not interested in membership, Tom was interested in friendship. He and Rabbi Vivian traded pulpits, the congregations cooperated on programs, and for several years, All Hallows generously allowed Or Hadash the use of its facilities for events that would not fit into the RRC’s Bet Midrash. Also in 1988, Barry and Donna Brian used their musical talents to start an all-volunteer choir, Makeylah, at Or Hadash. Over the years, many congregants participated, and some, like long-time member Peggy Mandell, even conducted when Barry was unavailable. By 1990, with many congregants holding life cycle events outside the RRC building, religious school being conducted in shifts, and alternative facilities necessary for an increasingly great number of congregation-wide events, the Board requested that Rosenberg intensify the search for a new building. Once a building was found, the Congregation, in true Reconstructionist fashion, needed to agree on a procedure for a vote of such importance. While the first building was turned down, a second was found and the Congregation voted to buy it. 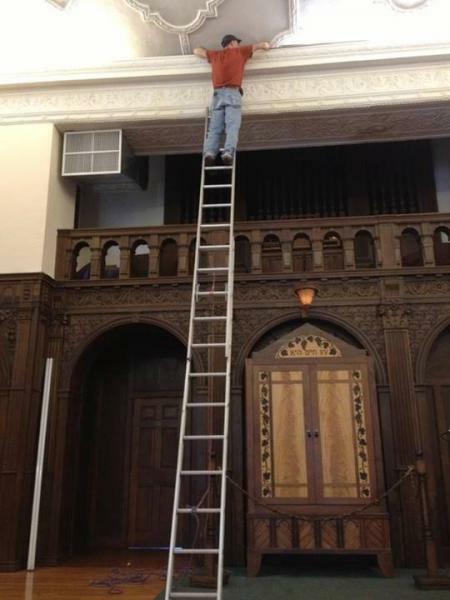 Eventually, however, it was determined that the final cost, with needed renovations, would be far too high and the Congregation went back to searching for buildings. In the fall of 1991, Rabbi Vivian became School Director, as well as Rabbi, and the following year saw the birth of the first Confirmation Class. A few years later, she invited congregants Jules and Ruth Mermelstein to teach the class, an inspired idea that benefited many years of Or Hadash teens. The continued growth of the school was among the major reasons for needing a larger home of the Congregation’s own. Various remedies were tried, including holding Sunday classes at Wyncote Academy. Nothing seemed like an acceptable solution. Barry Brian became President in 1992 and initiated work on many policies and procedures that organized the growing community. Or Hadash adopted a Mission Statement and a description of its core values. Havurot were formed and helped continue the small community ambiance as the Congregation grew. The Board approved “Standards for Board Members” and the Congregation approved revisions to the Bylaws that made the Congregation welcoming and inclusive for all people. The Executive Committee was established as a more effective and efficient organizational structure. Mitzvah cards were initiated at the 1992 Yom Kippur Avodah service as a way of reinterpreting the concept of sacrifice while capitalizing on members’ desires to offer their time and talents to the community. For the first time, in 1993, a Junior Congregation for 4th through 6th graders began meeting twice a month and the Congregation affiliated with Young Judea to provide a youth group for the children. That same year, at the suggestion of Karen Freedman, the congregation established the first Yizkor Book, recognizing that this was a wonderful way to honor loved ones who have passed away. The need for a building was becoming increasingly acute when, in November of 1994, congregant Melanie Gansler (z”l) spotted a “For Sale” sign on the New Life Presbyterian Church in Fort Washington. She called Barry, who immediately asked the Executive Committee to look at it. The former Cadwalader Mansion was perfect and, within a week, over 95 families had visited the building. Members made contributions of legal advice and inspections andthen votedoverwhelmingly to buy it. 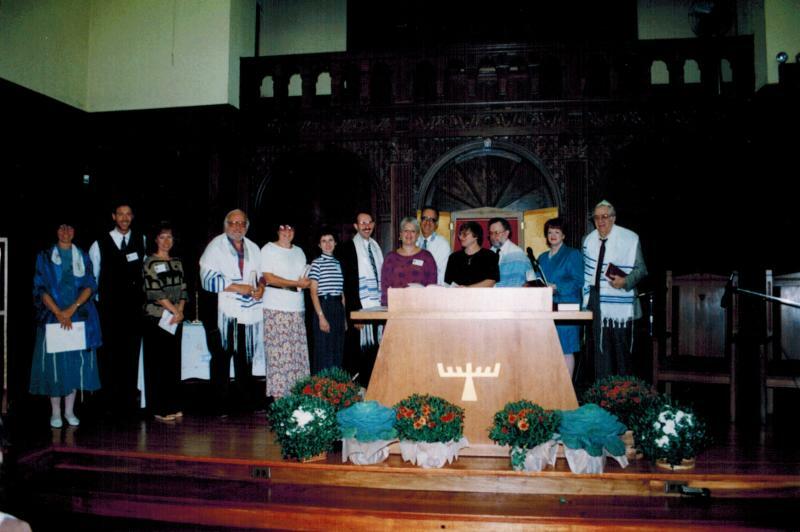 On June 30, 1995 just two days after the closing, over 140 congregants sang, danced, and welcomed Shabbat in their new sanctuary. With the new home came other new efforts. There was a new logo and brochure and even a new name: The Congregation voted to change its name to Or Hadash: A Reconstructionist Congregation. The Fund for the ‘90s was transformed into the Mi Dor L’Dor Committee and an effort was made to raise funds to pay off the mortgage. Congregants worked tirelessly and Or Hadash celebrated the beginning of her Bat Mitzvah year with a Dedication Weekend for the new building on September 17, 1995. With a home of its own, the Congregation needed a Building Committee, and Alan Endter (z”l) served as its first chairperson. An Aesthetics Committee was a subcommittee of the Building Committee, with Laura Feller and Michael Oswald as the moving forces behind the effort to make the building beautiful as well as safe and secure. And, now that the congregation had its own kitchen and areas to host events, a Kitchen Committee was formed, a Kashrut policy was drafted by a committee led by Beth Alper, and a special events policy was written. 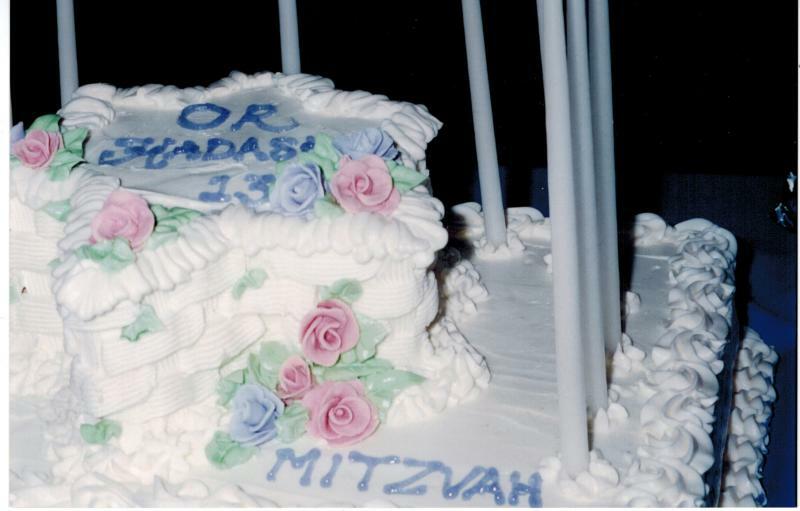 The Bat Mitzvah year ended, on May 18, 1996, with another joyous party. These years were a time of firsts. With Rabbi Vivian’s encouragement, the first adult B’nai Mitzvah class occurred during 1995-1996. Adult congregants dedicated themselves to study and then celebrated their achievement with the entire congregation. Many congregants who had not experienced the joy of being called to the Torah as a youth were now happily able to do so. Rabbi Vivian also encouraged Or Hadash to affiliate with the Interfaith Housing Network (now the Inter-Faith Housing Alliance). It was an opportunity tailor-made for Or Hadash: The Network assists homeless families save up for and obtain permanent housing. While in the IFHA program, families stay at area churches and synagogues, so they can work and save money. Volunteers, some of whom stay overnight with the families, provide warm and satisfying dinners, food supplies for breakfast and lunch, basic necessities, and transportation. OH volunteers threw themselves into this chance to live out the tzedakah that is one of the cornerstones of the Congregation. In 1995, for the first time, Or Hadash hired an office administrator and in 1996, during the term of President Larry Silverman (1996-1998), its first non-rabbinical student Educational Director. During those years, most of the energy and emphasis was on the building and the ongoing efforts to convert the former church into a Jewish space. Richard Malkin became the Congregation’s sixth president in 1998. During Richard’s term, 1998-2000, an Adult Ed program and a Performing Arts series were developed. Work Days, scheduled on a regular basis several times a year to clean and upgrade the building both inside and out, were started. And, the congregation finally launched Saturday morning Torah Study and services. While this had been attempted before, it had never caught on. This time, with Richard’s support, it became a priority for many members of the community. In 2000, Lori Rubin was hired as the Congregation’s Educational Director. In 2001, during Susan Afriat’s term as president (2000-2002), after 18 years as Or Hadash’s leader, Rabbi Vivian retired. A series of diverse events, designed to provide virtually every congregant with something meaningful and moving to attend, were held, starting in January with intimate dinners at Rabbi Vivian and Andy’s own home. That same month, she met congregants at the Museum of the University of Pennsylvania to tour the Canaan and Israel Exhibit. Other events included a Musical Extravaganza with a variety of vocal and instrumental performances; a lively Purim Spiel and a Women’s Seder; Minyan and Matzoh, when adult B’nai Mitzvah who had been tutored by Rabbi Vivian honored her by reading Torah; an Education Day, during which the Religious School children honored her with a tribute book; and Nature and Nurture, a walk in the Wissahickon woods followed by brunch and discussion at the Klotz-Lamb home. A final “Roast and Toast” for Rabbi Vivian was celebrated on June 30. Rabbi Steven Nathan became Rabbi of Or Hadash following Rabbi Vivian’s retirement. In response to a need expressed by members of the Congregation, Rabbi Steven initiated a Healing Service to comfort people who were dealing with illness, the death of a loved one, and other traumas. And, with the success of that Service, he suggested to the Hesed Committee that the many talented musicians in the Congregation record a CD that could be comforting to people who are sick. 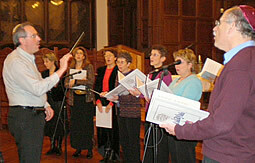 Cheryl Kripke Cohen, a member of the Committee, agreed to direct the project; Rhoda Gansler designed the liner notes; and many congregants worked on both the music and technical aspects of the project. When it was finished, in 2004, Lucia Herndon, a columnist for the Inquirer, featured the CD, “Healing Harmonies,” in one of her Sunday columns. Cheryl, who was studying to be a harp therapist, played on the CD and Rabbi Steven encouraged her to bring her beautiful and soothing music to Or Hadash’s services. The Hesed Committee, now chaired by Shelley Sanders, continues the warmth, intimacy, and personal commitment that have characterized Or Hadash from its start. Fran Swartz (z”l) served as president from 2002 to 2004 and helped lead the search for another rabbi when Rabbi Steven decided to pursue other paths. In 2002, as the result of a Capital Campaign, a number of much needed upgrades were made to the building, including lighting, new ceilings, signage, and upgrades to the library and heating system. It was also a time of expanding the Congregation’s youth programming, under the leadership of Lori Rubin. Camp JRF, the Reconstructionist Movement’s overnight camp, was founded in the summer of 2002 on a rented property outside of Chicago with 39 campers. Or Hadash’s Allison Moss began attending the next summer as a counselor and more Or Hadash children have attended each year since. Rabbi Joshua Waxman became the Congregation's new leader in 2004, and Shelley Kapnek Rosenberg was asked to step back into the role of President for another two-year term. Working with Rabbi Josh, the Spiritual Life (formerly Ritual) Committee, chaired for many years by Marty Jacobs, continued, in true Reconstructionist fashion, to innovate services and events that maintained the Or Hadash hallmark of combining creativity and spirituality. In an effort to reaffirm Or Hadash’s connection to the RRC, Rabbi Josh created the annual RRC Shabbat. The Kabbalat Shabbat service on Friday night features a D’var Torah presented by the RRC student who has won the George Goldman Or Hadash D’var Torah Prize, funded by former congregants Nick and Jan Goldman in memory of Nick’s father. A committee of congregants awards the prize for a D’var that is both scholarly and creative. During these years, Rhoda Gansler, with the help of Beth Alper, was the driving force behind the planning and construction of the Life Cycle Garden. Also during this time, Lori led work on retooling the School’s curriculum; a Long Range Planning Committee, chaired by Rick Dzubow, employed focus groups, interviews, and town hall meetings to create a new long term plan; the mortgage was [finally] paid off; and the Or Hadash logo and website were redesigned and updated. In the first year of Rick Dzubow’s presidency (2006-2010), the Rabbi’s study was beautifully redone. Thanks to a donation by long-time congregant Lewis Kapnek (z”l), in memory of his wife Arabelle (z”l), the Spiritual Life Committee was able to choose a more appropriate Bible, and the Congregation began using the new Etz Hayim Chumash at Saturday morning services. Michelle Smithman took the reins of the Kitchen Committee, which helps congregants create events and celebrations and makes each Oneg Shabbat special. In 2007-2008, Or Hadash celebrated its 25th Anniversary, with a full year of events organized around the theme "Celebrating Our Past, Anticipating Our Future.” Nationally acclaimed singer/songwriter, Debbie Friedman (z”l), kicked off the year with a concert in the Sanctuary in October. 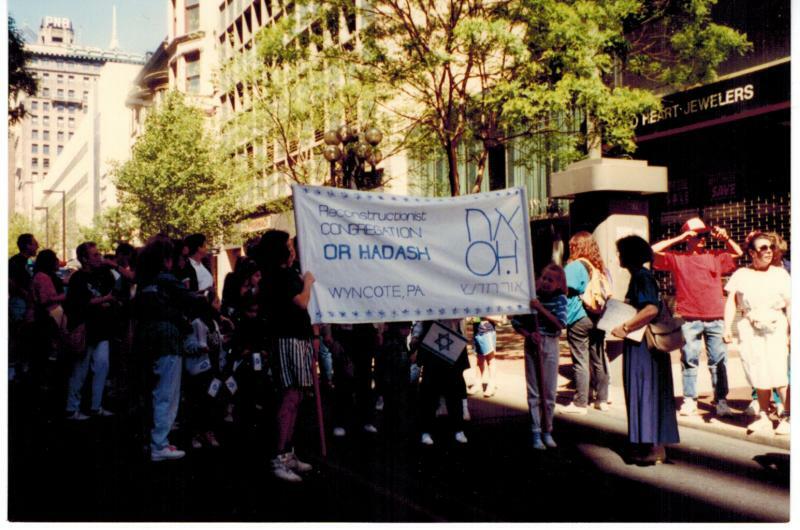 It was also the year that Or Hadash sponsored its first trip to Israel. From February 6 to 17, 41 adult congregants, led by Rabbi Josh, spent 10 days touring and learning about the country through a Reconstructionist lens. They visited Jerusalem, Tel Aviv, Masada, and the Galilee and Golan, met with Israeli Jews and Arabs, and spent part of Shabbat with Reconstructionist students who were studying in Israel for the year. Rabbi David Teutsch, Ph.D., a former President of the RRC and the first Dickstein Scholar-in-Residence, in 1988, returned to the Congregation’s bimah as the 25th Anniversary year’s Scholar-in-Residence. Another highlight of the Anniversary celebration was a Kabbalat Shabbat service led by the Congregation’s three full-time pulpit rabbis: Rabbi Emerita Vivian, Rabbi Steven, and Rabbi Josh. In a very special commemoration of its Silver Anniversary, the Congregation commissioned Rabbi Kevin Hale, a Reconstructionist sofer, to create a Megillat Esther scroll for Or Hadash. It may be the first Megillah scroll to combine hand scribing and digital media technology on Kosher parchment. Another feature that makes this scroll so special is that it is illustrated by 18 of Or Hadash’s own children. On March 16, 2008, the congregation held a siyyum, a ceremony during which congregants completed the scroll by filling in the few remaining letters, and the Megillah was dedicated. On March 20, it was read for the first time during Purim services. 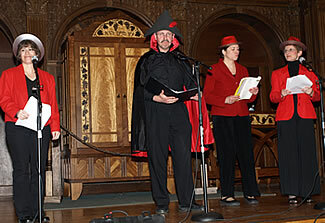 That year, as it had from the earliest days of the Congregation, the Purim celebration included a shpiel written, produced, and performed by congregants. This effort, a labor of laughter and love, was led for many years by Shelly Homer. 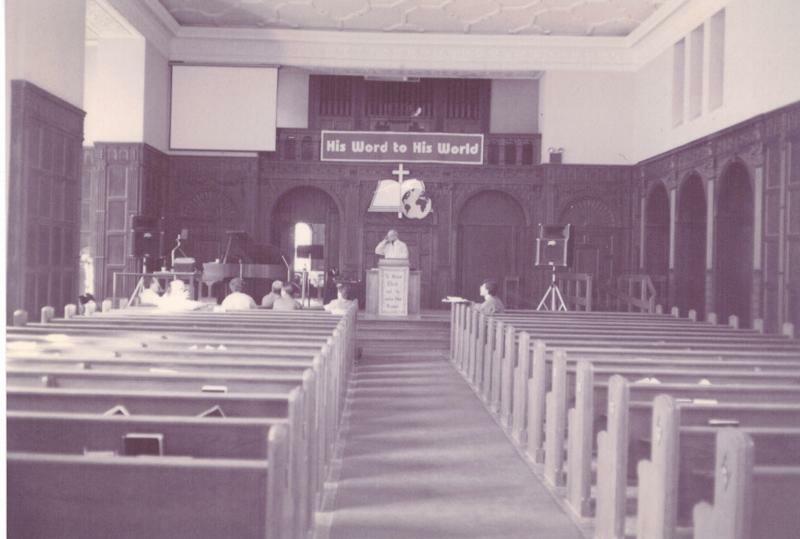 Later that year, the public was invited to a joint choir concert with the New Life Church, former residents of the congregation's building; a series of unique art shows, organized by Mike Oswald, were held in the Staircase Art Gallery; and a sports night was hosted by local celebrities. The Anniversary Year concluded with a joyful and fun-filled Gala in June. In May 2009, Or Hadash celebrated the completion and dedication of the Life Cycle Garden. 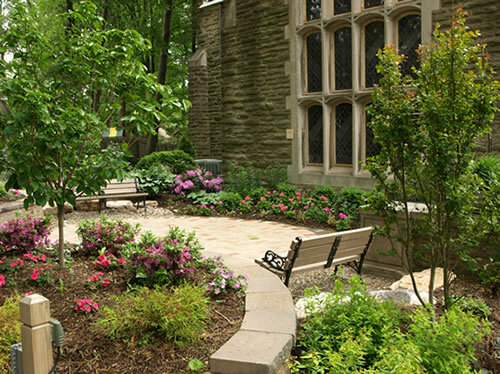 Begun as a memorial to congregant Melanie Gansler (z”l), who died of cancer at a young age, the Garden expanded to provide a space for all congregants to commemorate significant life cycle events of family and friends. This beautiful space provides an oasis of tranquility and peace for all who visit it. Also that year, the Community Room entrance was redesigned and beautiful new mosaics, designed by Arlene Golbin Burns, were installed with the help of Jeff Alper. In 2010, Rabbi Josh left for a year’s Sabbatical in Israel. Rabbi Roni Handler, a 5th year RRC student, who had spent a year as the Congregation’s Rabbinic Intern, took over the pulpit. A special congregational liaison committee was appointed by President Janet Karp (2010-1012) to smooth the transition and assist Rabbi Roni, who was still a full time student. Finally, in September 2011, the Congregation was able to celebrate the High Holidays within the beloved walls of its own building. After 29 years of wandering from Curtis Arboretum to Beaver College (Arcadia University) to Glenside Memorial Hall to Manor Junior College to the Sheraton Hotel at Fort Washington to Gratz College, we were home. Also, that fall, the Board voted to initiate the Campaign to Sustain and Renew Or Hadash. For the first time, the Congregation mounted an annual campaign to support its operating budget. The emphasis, in addition to raising needed funds and in true Or Hadash fashion, was having every member give something, no matter the amount, in order to participate with fellow congregants in supporting the community. In 2012, in the ongoing effort to maintain the beauty and safety of the building, the main office was redone and a new roof installed. Other changes included the hiring of Barbara Weisman as Education Director when Lori Rubin stepped down after 12 years to pursue other opportunities. Barbara continues working creatively with the Education Steering Committee, currently co-chaired by Jennifer Hoagland and Marianne Adler. Lori remains active, not only as a congregant, but also as Program and Community Development Coordinator, using her expertise and knowledge of the Congregation to help it thrive in other ways. Working with the Community Life Committee, now co-chaired by Amy Gewirtzman and Marilyn Jarvis, she helps create enjoyable programming that engages the hearts, minds, and spirits of the Congregation. The Bylaws of the Congregation were revised to further extend the role of non- Jewish members of an interfaith relationship so that they can chair committees and hold some officer positions. This has evolved over the years, as the Congregation has always recognized the contributions of its non-Jewish members, and it was an opportunity to expand their important role in the governance of OH. Lani Moss became Or Hadash’s twelfth President in 2012, guiding the Congregation as negotiations with Rabbi Josh were completed and he began his tenth year as Rabbi. Many policies and procedures were revisited, including the Congregation’s accounting and dues assistance practices, which were streamlined under the leadership of Treasurer Bruce Merenstein, and those around B’nai Mitzvah, which were reviewed and improved by a new B’nai Mitzvah Task Force. A new Vision Statement for the congregation was created, the printed Congregation Directory returned, a new calendar was produced, and the Ha Kesher was re-imagined to make it more accessible. Executive VP, Jay Cohen, was instrumental in assisting with many of these projects as he prepares to become the Congregation’s 13th president in May 2014. 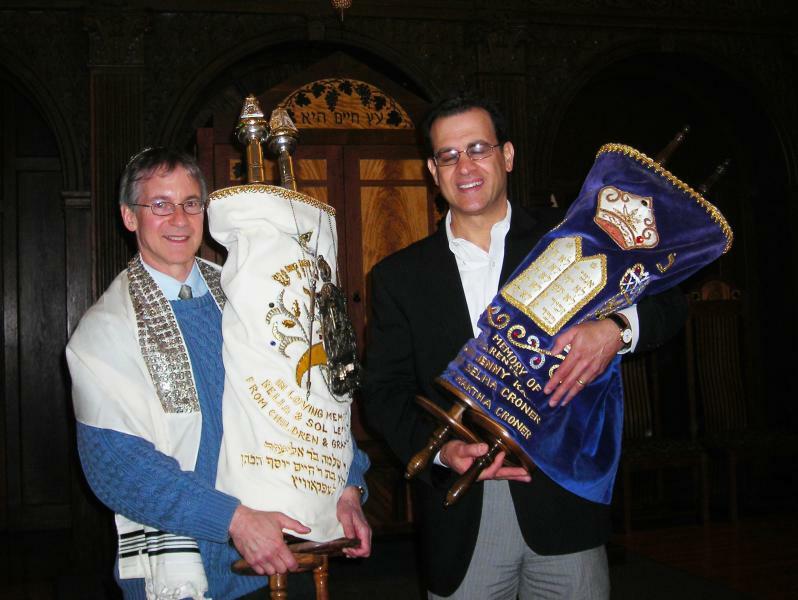 On May 5, 2013, the Congregation acquired two new Torahs, one on long-term loan from the Abramson Center for Jewish Life in Horsham, which was arranged by Scott Crespy, and one as a gift from Congregation Adas Israel in Fall River, MA, which was arranged by Jeff Chebot. A joyous celebration, which started at Abramson, continued at Or Hadash as congregants ushered the new Torahs into the sanctuary. And, in another effort to beautify the congregation’s lovely home, two art quilts, were commissioned by his family in memory of Alan Endter, Or Hadash’s dedicated first Building Committee Chairperson. The Building and Grounds Committee is currently chaired by Doug Smithman. The theme for the Congregation’s 30th Anniversary year is “Telling Our Stories,” which will come to life during the Scholar-in-Residence weekend featuring Jewish storyteller Peninah Schram. The 30th Anniversary Story Project, which like the biblical Devarim reminds the people of their history, has also brought our collective story and “our stories” to life. Or Hadash’s history is rich with warmth, commitment to community, creativity, and participation as its members weave its singular history into a bright future. May this community grow from strength to strength. What is your Or Hadash story? Please share a memory with us and we’ll add it to our collection. This project is a living, growing tribute to the Or Hadash community of which we are all an important part. Every story is important so please email yours to Shelley Rosenberg at rosenwrite@comcast.net. Direct links to the Or Hadash Stories are in the left sidebar of this page.